If the Panama Canal has always been on your bucket list, or if you're just looking for a memorable family vacation, a cruise with the Coral Princess is right for you. 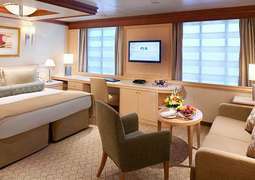 The legendary service standards of Princess Cruises ensure that your stateroom is both comfortable and practical. With ample space regardless of your class type, you won't have to sacrifice affordability for comfort. 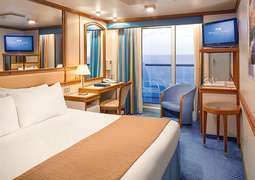 Beyond its exceptional staterooms, Coral Princess offers several dining options, including some restaurants associated with celebrity chefs. There are even more entertainment activities than restaurants. Browse the art gallery, place your bets at the casino, or immerse yourself in other cultures at Festivals of the World. Your kids will have havens of their own at their age-designated areas, filled with music, dancing, and games. Feel your knots unravel during a massage at the Lotus Spa, or stay fit at the sports center. No matter what you choose, you'll discover that Coral Princess is a hub of excitement and lifelong memories. Whether you opt for interior, suite, mini-suite, oceanview, balcony, or limited mobility accommodations, you'll always be cruising in style and comfort. 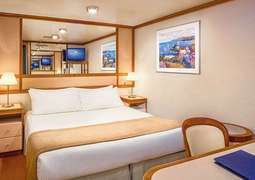 Between 158 and 162 square feet, interior staterooms are the most affordable option and come with a spacious closet and other great amenities. For a taste of luxury, spring for a suite. At 460 to 932 square feet, they come with a sitting area, balcony, tub, and other perks. All rooms come with 24-hour room service. If you're a night owl, you'll have to visit the International Café. Open 24 hours a day, it offers a changing selection of gourmet drinks and small meals and snacks. For foodies, Crafted by Curtis Stone offers a menu created by the celebrity chef. The best part? 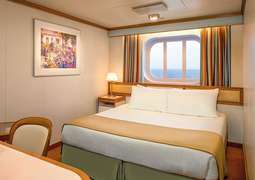 Both dining options are part of the cruise's included dining. For something from the specialty section, choose from an exclusive menu during the Chef's Table experience. Celebrate different cultures at Festivals of the World, where you'll dance and watch performances from around the word. Feeling lucky? Check out the casino and play the slots or roll the dice at the tables. Kids will also have fun dancing, playing, and watching movies at their designated play areas. Spend an evening with your family at the Princess Theater, where you'll be entranced by a Broadway-style show. Restaurants require formal or smart casual clothing. For women, skirts, dresses, sweaters, and slacks constitute smart casual, while men should wear open-neck shirts and pants. In the traditional and anytime dining sections, men are required to wear tuxedos, dining jackets, or dark suits during formal nights, while women should wear cocktail dresses or evening gowns.